It's a law many states have passed, so why is Florida holding back? After two City of Miami firefighters lost their battles to cancer, loved ones are fighting for the passage of a bill that would give firefighters in Florida long-term cancer coverage. NBC 6's Laura Rodriguez reports. At a moment's notice, firefighters are ready to jump into action and save lives. They take a risk every time they battle a fire, but it's not just the flames that are endangering them. "Cancer is actually the leading cause of death among firefighters," Carmen Ordoñez said. Carmen Ordoñez' husband, Miami firefighter Fernando Ordoñez, died of stomach cancer at 34 years old and left behind a young son, who was only two years old at the time. That same year, Meaghan Garcia lost her 28-year-old husband Ralf, who was also a firefighter in Miami, to brain cancer. She was seven months pregnant. "This was the day I met our beautiful baby boy Mason," she said while holding up a picture of her newborn son. "And Ralf couldn't be there." A CDC study also shows firefighters showed higher rates of certain types of cancer than the general U.S. population. Since their deaths, the city of Miami has implemented safety measures to minimize the risk of cancer, which includes a decontamination process right after leaving a fire. First responders must also put their dirty gear into bags and switch it out for new bunker gear. Walking out of a fire with a soot-covered face used to be a badge of honor – but now, that's no longer the case. 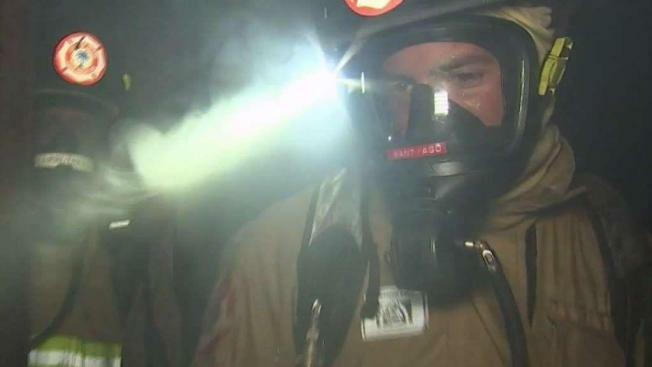 "Ashes and the actual smoke permeate into the bunker gear and ultimately onto the skin and into the pores, and that's what we're trying to prevent," Miami deputy fire chief Alex Fernandez said. But families who have lost loved ones say more action is necessary. They're hoping Florida lawmakers will pass House Bill 857, a law that would grant certain benefits to firefighters upon receiving a cancer diagnosis, including disability payments and death benefits. The bill, however, appears to have stalled, and it's unable to get a hearing in Tallahassee. "It has not reached the House floor because of one person, the Speaker of the House Jose Oliva, which, for reasons that go beyond comprehension, has ignored not only the science and the economics, but has taken it upon himself to establish a one-person process," said Juan Garcia, Ralf Garcia's father. Oliva did not respond to NBC 6's multiple requests for comment, however, other published reports show he believes this is an issue best dealt with at the county level, saying that the House has supported other tax breaks for surviving spouses of first responders. "Forty-four other states disagree because they've all passed these laws. Forty-four out of 50 states," said Freddy Delgado of the Miami Association of Firefighters. In March, hundreds of boots were placed outside the state Capitol, representing all Florida firefighters who have died of cancer or currently have the illness. And among them were the boots of Ralf Garcia and Fernando Ordoñez. "It's too late for us, but it's never too late for other families, because they need our help," Juan Garcia said. There's just over three weeks until the session ends, and without Oliva's support in the House, this bill is unlikely to pass. But the firefighters hope something happens to spark change in the coming weeks. "These firefighters are risking their lives to help us and that's the least that we can do to protect them," Carmen Ordoñez said. "Not only for them, but for the family."